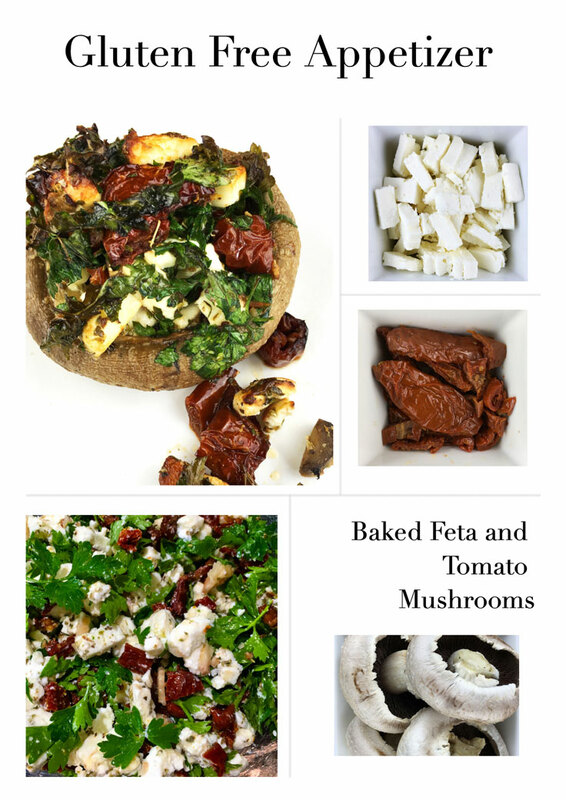 Gluten Free Appetizer, delicious baked feta and tomato mushrooms with healthy herbs. Super easy to make. Ideal for a dinner party or as a tasty low carb light meal. 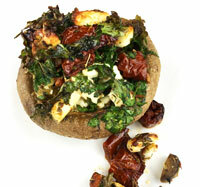 Large mushrooms, oven baked with a richly flavoured sun-dried, feta cheese and herb filling. This easy, naturally gluten free recipes is a great way to start your dinner party or give yourself a tasty healthy meal. I like to prepare as much as I can before my guests arrive. It helps to reduce my stress levels if I know I have as much of the meal as possible ready to cook or already cooking. It all adds to the enjoyment of the evening and gives more time for chatting once guests arrive. This gluten free appetizer recipe is particularly good as it improves when prepared in advance. Make the filling up to a day in advance and store in a covered container in the fridge. 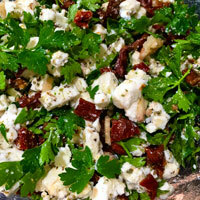 The sun-dried tomatoes, feta cheese, oregano and parsley marinade intensifying the flavours. 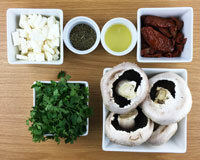 Before your guests arrive, place the mushrooms on a baking tray and stuff with your tomato, feta and herb filling. Place any excess filling in a Ramekin. When you are ready, simply brush with oil and pop in the oven. Serve hot, straight from the oven. This recipe was inspired by a summer I spent in France. The weekly food markets with their colourful stalls of fresh vegetables and herbs, the cheese stall that quickly became a firm favourite and the massive fish stall run by four generations of the same family reminded me how wonderful food can be. All those fantastic ingredients, particularly the vegetables and herbs got my recipe creating juices flowing and there was no stopping me when I got home. These baked feta and tomato mushrooms with herbs were one of the first French inspired recipes I created on returning from France. A dinner party with some Francophile friends seemed an ideal opportunity to try it out. Mushrooms, the new super food! Ok, a bit of an exaggeration but according to the Times, recent research published in the journal Food Chemistry indicates that mushrooms contain unusually high amounts of two antioxidants. Useful for boosting health It is great to know that such a useful vegetable is so good for you. Keeping to the French theme for the evening, ensuring we had a delicious wine to have with our appetizer seemed appropriate. Deciding which wine would pair best with our baked feta and tomato mushrooms proved great fun as we ran a mini wine tasting to decide which of three wines we liked best. Check out the results in the post on our sister site how2enjoywine.com. Gluten Free Appetizer, delicious baked feta and tomato mushrooms with healthy herbs. These quantities should make more filling than will fit into 4 mushrooms. Bake the excess in a ramekin. 1. Remove the mushroom stalks carefully avoiding breaking the mushrooms. 2. Chop the stalks finely. 3. 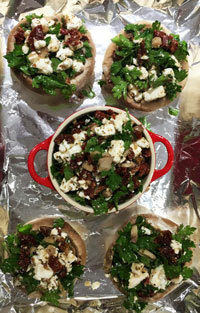 Place the chopped mushroom pieces in a bowl, add the roughly chopped feta cheese and sun-dried tomatoes. Stir well. 4. Add the oregano and parsley. 5. Pour in 2 tablespoons of olive oil and stir everything together ensuring well mixed. 6. Place in a covered container and store in the fridge until required. 2. 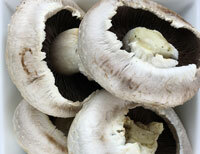 Brush the mushrooms (both sides) with olive oil. 4. Stuff each of the mushrooms with the feta and tomato filling. 5. Place any excess in a ramekin and place on a baking tray. 6. Bake the mushrooms and ramekin (uncovered) for 20-25 minutes. 7. Serve immediately from the oven. 8. Place one mushroom on each plate with a quarter of the excess filling and sprinkle with a little fresh parsley.